When I worked as a picture editor for the Indianapolis Star, one of the techniques I liked to pull out of my back pocket when appropriate was the use of photographs in combination. I now use the same idea in slideshows, blogposts, and wedding album design. There are several reasons to use photos in combination. In this example, the photos are used in a series of three to show the changing expressions on Lori's face. Capturing emotion is at the heart of wedding photojournalism, but often expressions and emotions flow from one to the next -- a series helps capture this flow. Another reason to use a combo of photographs is to show a small detail, Lori's Dad's boutineer, and then how it is used. Here the series contrasts Matt with one of his groomsmen and his Dad, all in similar poses, but with slightly different expressions. Action combos, like the one below, work best if all the characters from one photo, Lori, two bridesmaids and Mom, appear in the next. 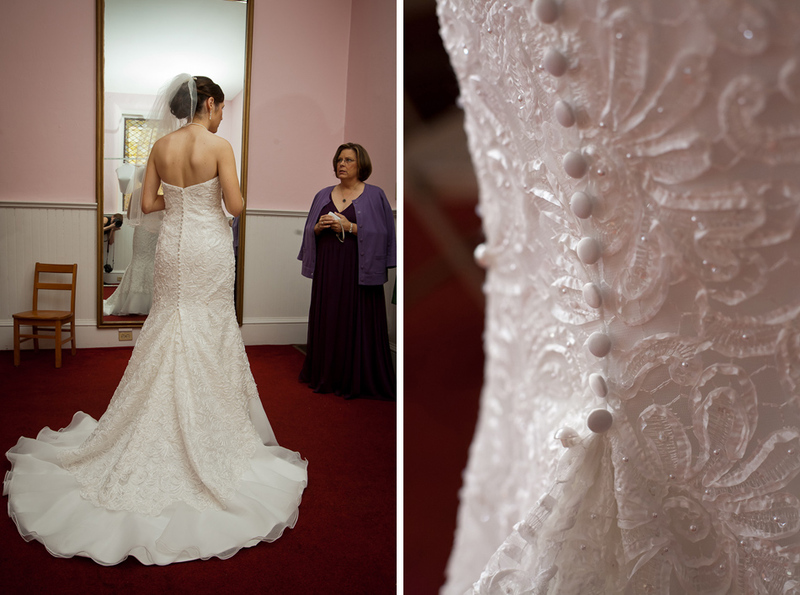 The contrast in this combo comes simply from the far away view of Lori in her dress vs the close-up dress detail. When using this type of combo make sure the detail is especially interesting. In this combo we see a scattered group of family and friends come together in community to pray. This final series uses three images to show unfolding action. The tiny arm movements before the wedding become a dance when put together in a series. Rock on, Lori!